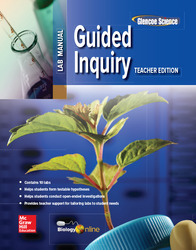 Guided Inquiry Lab Manual, Teacher Edition The ten guided inquiry activities included in the Guided Inquiry Lab Manual help students develop educational, career, and life skills, while learning biology! They'll learn to think for themselves, how to solve problems, and how to apply prior knowledge to new situations. Important biological concepts are the core to each activity. Students gain practice in developing questions and testing their own hypotheses, designing experiments, gathering and analyzing data, and communicating their conclusions to their peers. As the year progresses, they should feel more comfortable designing their own procedures and conducting their own experiments. This Teacher Edition provides strategies to guide students who need additional structure and to encourage those who are ready for more open-ended exploration.